My journal sketchbooks about creativity filled during my first two decades as a serious artist and my investigations as a painter, gardener, mother, and writer inspired the writing of this book. It contains plentiful images of paintings and drawings from my San Francisco backyard annual garden and the wilder perennial garden and landscape in Sonoma County where I now live. It was a joy to write, and I am continually rewarded by hearing from readers. Please let me know how this book has inspired your creativity. Originally published by Warner Books. Over 60 full color paintings, 144 pages ISBN 0-9700217-0-4. Now distributed by Compozarts. 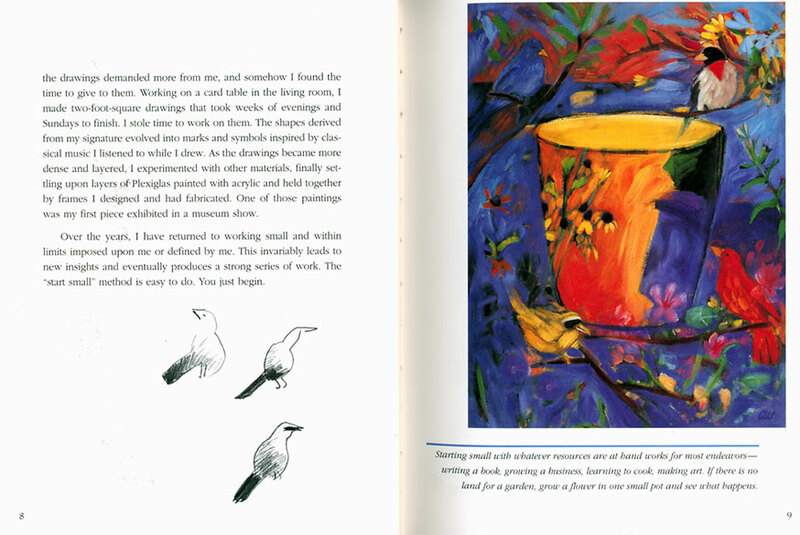 A Painter's Garden, the parallels between lessons in the garden, the studio, and life ring true. Christine Walker's writing is intelligent, evocative, elegant, and articulate. She addresses universal truths about the creative process in an accessible and fresh way. And she renders very complex emotions in beautifully simple terms...weaving her experiences of motherhood into an examination of her working methods in the studio...feeling a cadence as measured as the breathing of a sleeping child. A wonderful tale of how she came to love gardening and make her mark on this little plot of land. It's lush, gorgeous and well worth hunting up at your favorite bookstore! The prose will touch the hearts of many who renew and rest their souls in a garden and give them topics to ponder during leisurely winter garden days. What a happy book! Christine Walker celebrates the flow of creative energy from the earth transformed by inspiration to her chosen medium of pigment. She shows what harmony feels like. This is a beautiful and joyous book, celebrating the creative spirit in nature and its transformation into an expressive medium. 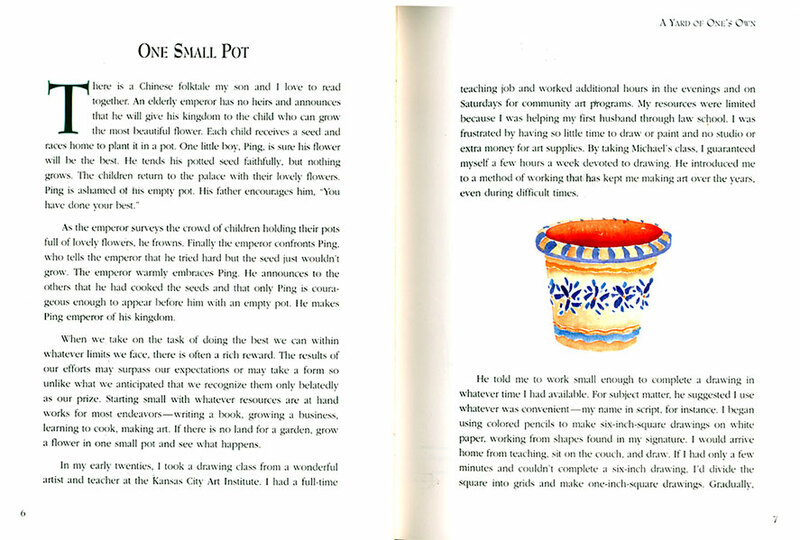 Arlene Bernstein, Author of Growing Season In joining a long tradition of artists who have turned their eyes to the garden, Christine Walker goes one farther and gets her hands on the trowel, the pruning shears, the shovel, into the dirt. The result is a uniquely feminine view of the cycles of cultivation and the wisdom of the seasons. Reading this book our gaze shifts from the garden to creative work to life itself, as easily as the lens of a camera allows us to follow its focus from close, to far, to close again. Full of surprise and promise, the garden seen through the eyes of a painter is a wise and constant teacher. Taken as a whole, the essays tell the story of Walker's dream for a certain kind of creative life and how it was fulfilled. I could almost feel my creative spirit soaring! Wrap up this gift of images and words for a thoughtful gift for anyone with an interest in gardening, painting or writing, or simply someone possessing a creative soul. 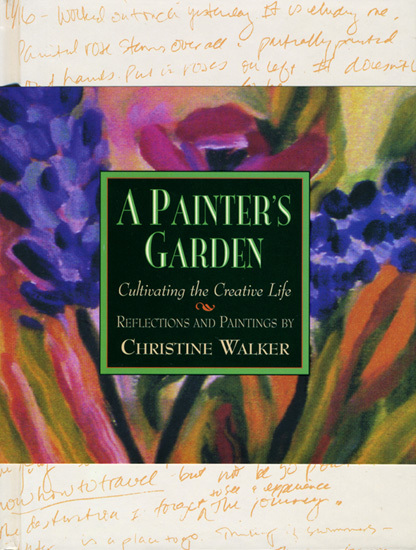 Christine Walker weaves her roles as a painter, writer, mother and gardener into a delightful tapestry of interesting observations on the cycle of gardening. Her paintings are bright and thought provoking. This is a book to enjoy in small bites. This inspiring book is filled with beauty, wisdom, and insight. Christine Walker gently reminds us of gardening's great lessons for our creative journey. This is a book to read and reread: a gift to treasure. It's not enough to dream, although it is necessary to have a clear vision. Parents and teachers praise hard work, but many of the wise advocate effortlessness. Faith ranks high, but one's faith is always tested. Good luck counts, but not without the bad, because that often heralds good fortune. Talent, knowledge, and skill in one's chosen field are required, but naivete and an openness to learning sometimes bring profound insights and a wealth of good ideas. Regardless of the paths we take, getting "there" never ends up being exactly where we think it is going to be. Creativity is not a simple step-by-step process, but a cycle. Much like plants need the seasons, we need to establish and feel creative rhythms that let us root and flourish, lie fallow, and bloom again. Whether making paintings, writing songs, or growing a business, it is the creative life that is being formed, not just the products of our hands and minds. I began cultivating a garden to have subject matter for my paintings. Now the garden more than inspires my art; it offers me, daily, a way to grow and change. As it takes a lifetime to mother a child, it may take that stretch of time to learn to grow a garden or paint in one's true voice. The manifestations of one's nurturing, ideas, values, and small tasks are not finite products, but rather a series of revelations. Participating attentively in their creation gives one back realms to explore. The child becomes a friend whose personality intrigues. The garden grows lush and dies back, continually offering up its bare spots for further experiments in cultivation. The paintings point to other places to go. Shrinking to follow the brush tip or expanding to view horizons of color, I participate fully in this journey, paying for the privilege with all my attention. I'm building my paintings as if my survival depended on them. I raid the brush pile for sticks, bring an armful into the studio, and press a curved and forked branch up against the canvas. With a loaded brush, I paint over the stick and release it, leaving a trace of the graceful arc and awkward prongs against the image below. It feels right to do this; I want the presence of the garden in my paintings. As I stencil twigs and branches onto the canvas, I find a rhythm. The painting becomes a chant. A humming penetrates every pocket of the studio, enveloping me in a shell of light and color and form. Through the window I see a sparrow dart about and vanish into the brush pile, where she has probably built her nest. Like her, I seek solace in a sanctuary of my own making. A nest can be any cozy place where we feel safe. I remember lying on the couch holding Quinn when he was a baby, his sleepy warmth rising and falling against my chest. Napping with him worked a spell on me; I felt as if I had been carried away to an enchanted place. My mind would race with countless things I needed to do, but I was unable to move. Although I knew I could disengage myselft, put him in his crib, and have an uninterrupted hour to work, I lay still. I had never known such complete peace and joy. When he roused, his sweet breath stirred the air. Wide-eyed and rosy-cheeked, he stared at me for a moment before his face woke into a smile of recognition. Then he would wriggle and squirm, getting on with the job of being a baby. Creating in my studio nest, there is a magic time. It is not when the hoped-for phone call comes, offering the exhibition or contract. Nor is it in the hustle and bustle of preparations and celebrations. While painting, there is an occasional cluster of moments when I'm deeply at peace, blissfully embracing the weight of the work, feeling a cadence as measured as the breathing of a sleeping child. A Painter's Garden: Cultivating the Creative Life. Originally published by Warner Books. Over 60 full color paintings, 144 pages ISBN 0-9700217-0-4. Now distributed by Compozarts.